Melbourne is renowned for its ability to dish up four seasons in one day, but in the depths of winter there only seems to be one weather condition… Cold! 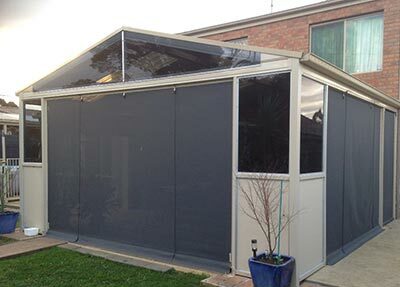 So if you live in Melbourne and want to get more use out of your outside living area, outdoor blinds are well worth considering. Rohan Burch from Outside Concepts in Dandenong recently installed outdoor blinds on a verandah that he and his team built approximately two years ago. A combination of café blinds, which need to be raised and lowered using pulleys and ropes, and ziptrak blinds, which are spring loaded and more easily operated, were used in the project to keep costs down while providing the functionality the owners were after. The café blinds were installed in areas where the owner would only raise them occasionally, while the spring loaded blinds were installed in doorways. 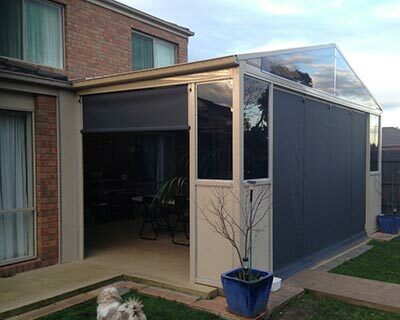 For added privacy and to reduce sun glare, shadeview fabric was used throughout. To reduce the width of the blinds required, blueboard and tinted Perspex infills were installed in the corners of the verandah. The result is an outdoor living area that will be more comfortable to use during winter, particularly when combined with an outdoor heater. Just as importantly, the area will also be more comfortable in hot weather, with the wind and sun protection that the blinds provide.